How Do Ceramic Pot Filters Work? Key to the construction of ceramic pot filters is the mixture of dry clay with a combustible material (or “burn-out” material) like sawdust, rice hulls, or coffee husks. The dry clay and combustible material are sieved through a fine screen and then mixed together with water to form a homogeneous mixture. The mixture is pressed into the pot shape using a mold and hydraulic press. The resulting pot (approximately 11 inches wide at the top and 10 inches wide at the bottom) is fired in a kiln, and the combustible material is burned out, leaving a network of micro-pores through which water can pass. It is these micro-pores that trap sediment and pathogens. Therefore, the proper mixture of clay and combustible material, and the proper type of combustible material are vital to the establishing the proper flow rate and effectiveness of the filter. RDIC now also adds laterite, a material high in iron oxides, to the clay. Laterite has been shown to bind and remove viruses from the water. A colloidal silver solution is applied to the inside and the outside of the finished ceramic water filter element, and is absorbed into the pores. Silver has been shown to act as a biocide. Length of contact time affects the ability of silver to act upon pathogens, so again, proper construction techniques, which yield the proper flow rate of water through the filter element, are of key importance. The completed ceramic pot filter element is placed in a plastic or ceramic receptacle with a lid and a spigot or faucet. When contaminated water is poured into the filter element, it passes slowly through the micro-pores in the ceramic material. It is then collected in the receptacle tank, which acts as a storage container, alleviating the need for another storage vessel. The user simply opens the spigot when they need water. Turbid water should be settled out first, before being introduced into the filter, since sediment will tend to plug the pores in the ceramic. How Well Does a Ceramic Pot Filter Work? 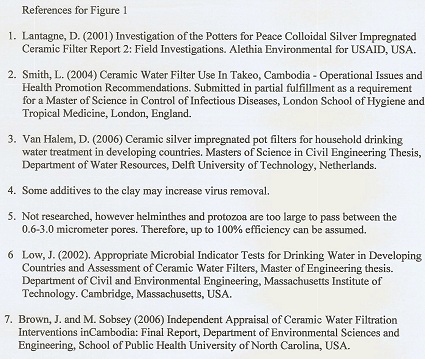 WSP/UNICEF have studied the implementation and effectiveness of ceramic pot filters in Cambodia. 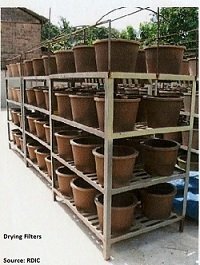 If properly constructed, operated, and maintained, a ceramic pot filter will be very effective in producing safe clean water. Figure 1 shows that ceramic pot filters, treated with colloidal silver have been tested to be 99-100% effective in removing bacteria and parasites. Return to "Ceramic Water Filters" from Ceramic Water Filter"